IRROmesh is a compact, solar-powered, wireless system for in-field measurement of soil moisture, temperature, and other parameters. Sensor data from each node is routed through an interactive mesh network back to a central point where it can be uploaded to the web and made accessible to anyone with an Internet enabled PC or smart device, or stored locally for collection. Each node is capable of reading three soil moisture sensors and a soil temperature sensor, along with inputs for recording irrigation events and rain gauge data. 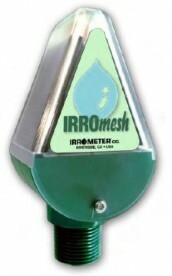 The Irrometer Watermark soil moisture sensor designed to measure soil moisture tension in irrigated field crops, vines, and trees planted in all soil types suitable for agriculture and turf irrigation systems. Suitable for use with data logging devices.